Friday night is a great night for basketball and there will be plenty of Euroleague basketball betting opportunities on Friday the 24th of October. Round 2 in the Euroleague continues and there are some excellent games that will help you kickstart your weekend in fine style. 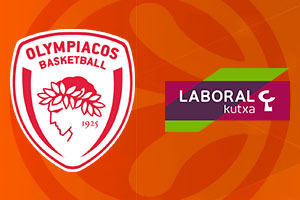 A stunning win in Valencia gave Olympiacos Piraeus a flying start to the 2014/15 season and with 21 points and 5 assists, Vassilis Spanoulis looks to be the man on form. He will be the player that Vitoria will be looking to stop but with Kostas Sloukas and Matt Lojeski both serving up 14 points in the win in Spain, it is clear that the Greek team have the firepower that is needed to win games. They also have a hugely passionate home crowd behind them, which means that Laboral Kutxa Vitoria have it all to do in Round 2. Of course though, Laboral Kutxa Vitoria are coming into this match off of an opening round win as well, so they needn’t feel overawed. It was a debut to remember for Davis Bertans, who notched 20 points and there was a Euroleague career high for Thomas Heurtel with respect to his 10 assists, but he also managed to serve up 13 points as well. These two players were instrumental in an excellent win at the start of the campaign and if Vitoria are to have any success in Greece, these are the players that will need to step up and be counted. Olympiacos are massive favourites with the bookmakers on this one, so you will need to scout around to see where the value is to be found for this match, which may mean the OVERS / UNDERS market is essential. Unicaja Malaga grabbed a big win on the road in Croatia on their opening game in the 2014/15 Euroleague campaign and they are well fancied to make it 2-0 when they face Alba Berlin in Spain. With Fran Vasquez grabbing 13 points in the second quarter in that game and Ryan Toolson serving up 20 points, Malaga will have a great deal of confidence coming into this game. Alba Berlin lost out at home against CSKA Moscow and there are not too many people tipping them to be a success on the road in Malaga. With bookies odds of around 5.50 for a Berlin win, and the +9.5 odds standing at 1.90, it could be a tough night for the team from Berlin. In the game against Moscow they did show that they have players who can grab points though with Reggie Redding reaching 11 points but it was the Euroleague debuts of Jamel McLean and Niels Giffey, both grabbing 9 points, that will give Alba some encouragement. For all that there will be hope for Alba though, odds of 1.16 for Malaga indicate that they are clear favourites and if you are running an accumulator bet on Round 2 matches, placing money on Malaga is likely to be a sensible option. Reggie Redding delivered 11 points for Alba but the Berlin side will be pleased that both Niels Giffey and Jamel McLean both picked up 9 points on their Euroleague debut. Unics Kazan lost out in Turkey in their opening game in the 2014/15 Euroleague, and a large part of this was down to a very slow start. The team will need to start more effectively although it should be noted that once they got up to speed, they looked quite formidable. Keith Lanford picked up 19 points on the road in that opening game and James White more than delivered with 13 points and 10 rebounds. Madrid had a hard fought win over Kaunas to kick start their campaign with Felipe Reyes and Gustavo Ayon being the top men on the night. There is every chance that they will be the two players at the fore in Kazan for Madrid this week. Real Madrid are a team that are always more than capable of winning on the road and with odds of 1.50 on offer for an away victory, this is something that will provide a decent return without (hopefully), offering up too much of a risk.